One common way to protect NTC thermistors from damage that might impair performance is to encase them or house them in epoxy. The chemical characteristics used to protect NTC thermistors are found in industrial grade epoxy with a high dielectric strength and thermal conductivity. 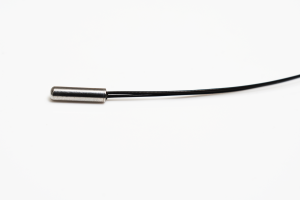 An epoxy coated NTC thermistor temperature sensor appears as a tear-drop-shaped bead with two radial wire leads. 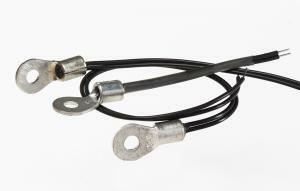 Very often these types of NTC thermistor temperature sensors are used with applications in proximity to moisture. Some of these applications include medical devices that measure air flow and air temperature. Epoxy bead thermistors are also frequently used in automotive applications to monitor and control air conditioning and seat warming for passenger cabins. 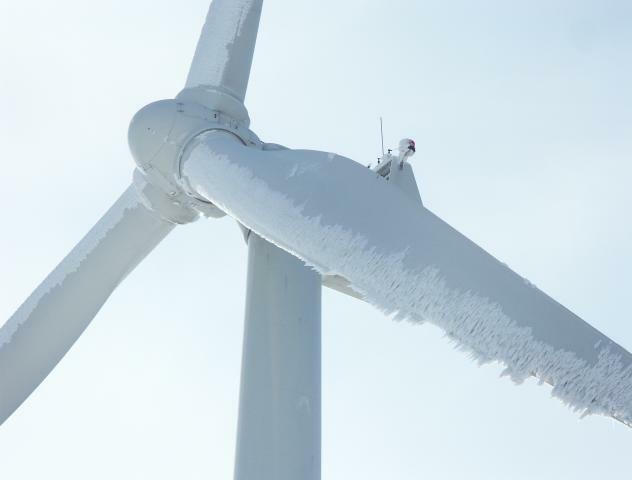 Green energy resources like wind turbines encounter potentially damaging conditions in cold climates. Freezing rain or below freezing temperatures can lead to blade icing that causes reduced power output and increased rotor loads. NTC thermistor probes monitor and control blade temperatures to allow turbines’ automated on/off controls to respond quickly. It is critical that NTC thermistors are protected from direct exposure to fluids, such as water or oil. To accomplish this, thermally conductive epoxy is used as an encapsulant, called “potting,” to seal the NTC thermistor temperature sensors in a stainless steel housing. This epoxy not only protects the NTC sensor from moisture but enables good thermal conduction from the medium being measured to the thermistor sensor. The thermally conductive epoxy provides operating effectiveness without degradation. 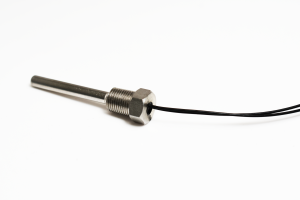 A stainless steel sensor probe used in automotive applications can measure the oil temperature of a vehicle’s engine, oil level and viscosity, and the engine’s coolant temperatures. 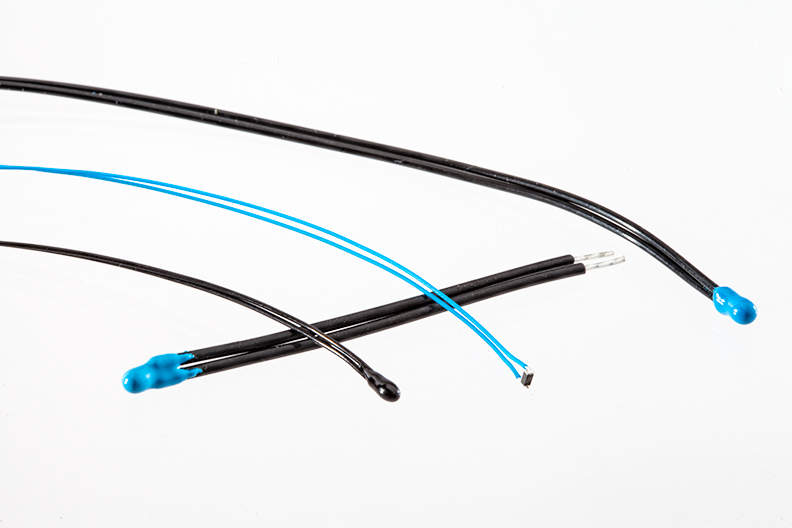 Another type of NTC thermistor that is potted into a probe assembly is a Ring Lug Probe. 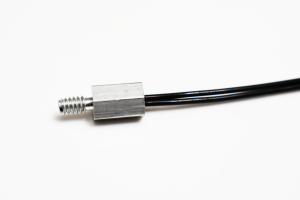 This thermistor assembly is used to measure surface temperature. Ring lug thermistor temperature sensor probes are often mounted to heat sinks to measure the operating temperature of power components. They are also increasingly used on lithium ion battery terminals to monitor battery temperature during the charge and discharge cycles for efficiency and safety. Epoxy coating or potting provides a barrier to moisture, preventing incursion of water vapor into contact with the thermistor sensor. 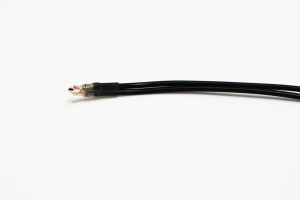 This contributes to a Moisture Sensitivity Level 1 (MSL 1) rating, which indicates the thermistor is protected for an unlimited length of time from moisture infiltration. 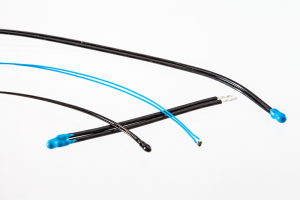 Sealing an NTC thermistor in epoxy protects the sensor from incidental impact during manufacturing and operation. Without this protection, an impact might cause the thermistor to lose critical tolerances required for long-term accuracy. Epoxy coating or potting can also provide effective protection in applications where the thermistor probe is prone to high energy or high frequency vibration, such as that associated with mining equipment, industrial vehicles, and aircraft. The type of epoxy used to seal and coat NTC thermistors can also provide protection in the form of electrical insulation. Accidental electrical contact with other components, metal enclosures, or chassis parts can damage the thermistor. Epoxy coating also prevents oxidation from forming on the surface of the thermistor. Epoxy coating is both flame resistant and flame retardant. This important feature of industrial grade epoxy results from an additive in the epoxy coating that contributes to the overall safety of the product. 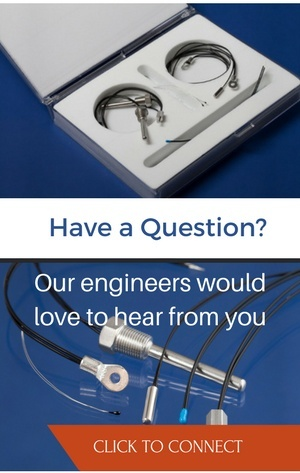 To learn more about NTC thermistors or talk to an engineer, call us today. If you would like a free sample to test in your application or project, call us or fill out a request online.